Do you have questions about our Midnite Solar battery accessorys, or questions about solar in general? Give us a call at 1-800-472-1142. Midnite’s 1,000 amp battery combiner box is the ideal solution for high-powered systems with a large number of DC conductors. 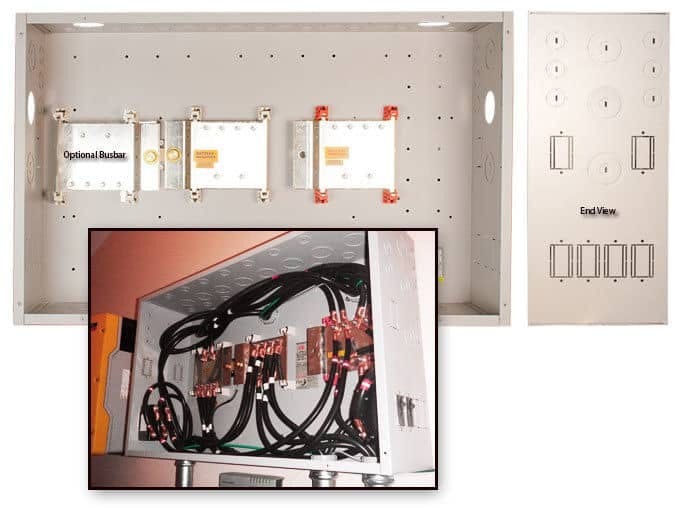 For example a large off-grid or battery backup system with several inverters and charge controllers will likely require a big DC positive and negative bus to combine all of the inverters and controllers for connection to the battery bank. The Midnite MNBCB-1000/100 battery combiner is the best solution we’ve found for large battery-based systems. There are plenty of conduit knockouts and breaker slots for installing a large number of battery conductors with overcurrent protection. 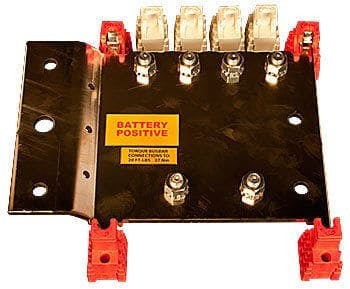 The Midnite MNBCB includes positive and negative 1,000 amp bus bars and this version (MNBCB 1000/100) includes a 1,000 amp 100 milivolt shunt which works with most battery monitors such as systems from Magnum Energy, Outback Power and Schneider Electric. The SMA Sunny Island will need to use the MNBCB-1000/50 Battery Combiner, item number 8955040.